This time he was closer. He had started from the other end of the car and was working his way down. He might have hopped on a few stops ago, and was switching cars on each stop. This time his voice triggered the memories from my days as the idealist newbie on the job. Ignoring the warnings of other teachers and administrators who told me to keep my distance. They told me to be helpful, and nice, but not too friendly with this one because he doesn’t know how to act. This isn’t the first time my idealism stirred with my hard headedness got me mixed into some problems. Just as my colleagues had told me, this boy became completely sexually inappropriate with me. He took my kindness as a sexual come on, because that’s the way kindness had always been shared with him. Kind gestures were always a means to a perverted end. His early brushes with kind words and complements where just part of a sexual transaction, the worst kind of sexual transaction if you asked his Born Again mom. There was the time where he answered the seemingly innocuous class question “what is your favorite food” by looking dead at me and saying “hot dogs and bananas,” making the entire class laugh, and me squirm in my grown man chair. There were the times he told his classmates he was in love with me, the kind of classmates in the kind of school where this story had caramel and sprinkles, embellished with a cherry on top before the end of first period. Then there was the deal breaker, when he beat me back to classroom after lunch, and in front of the entire class took a whiff of my coat to inhale my smell, like a fat kid in a bakery. It freaked out everyone, and made me realized I couldn’t be his special teacher friend the way I wanted to be. I felt real empathy for him. All of the students at this school were “special needs”, but most of them could hide it, for at least a few moments. Until they were forced to have to speak up or interact with “normal people”, or when their particular neurotic fuse was lit. But this kid couldn’t hide. Because of his facial deformities, he was special before he could say “hi”. His world was nothing like any world I would ever know, and I still to this day (sexual inappropriateness and all) feel a sense of sorrow for him that I don’t want to feel for anyone. The voice hangs directly over me, getting ready to speed by with his request to the next aisle. “Wzup Man!” I exclaimed. He stopped, dumbfounded, trying to remember where he knew me. We’ve bumped into each other before. Usually on Georgia Ave, usually with his clothes in various levels of disrepair. He obviously doesn’t remember all of our interactions, because he treats this one like our first one since school. He doesn’t remember the sandwich I bought him from Sankofa. He doesn’t recall the other time I offered to walk with him to Martha’s Table. “Hi,” he said tentatively. He knew he recognized me, but it took him at least 10 seconds before he realized who I was. Then he was struck with memories of our interactions from his own hazy view of events. “You need something to eat?” I said, “follow us, we get off in a few stops, I’ll buy you a sandwich”. “I’m okay”, he said, “I see you got your kids, I don’t want to take food out of their mouths”. “I’m not going to see a former student of mine begging on the subway and not help bro. Have a seat, we’ll get off soon,” I said. I’m thinking I’m helping him as well as the tourist and weekend shifters from having to deal with the visual and emotional shock of dealing with his pleas. “So what’s going on?” I ask. “My mom kicked me out again” he replied. Same story. Different day. I’ve heard it in these exact words at least 3 times. “You had company over the house again?” I said. He smiled, and hung his head a little. “I’m grown! Why can’t my mother let me have company?” It’s not that she doesn’t want him to have company. It’s that him and his company do grown people stuff. And it’s not that she doesn’t want her son doing grown people stuff, it’s that she wants grandchildren, and her son to go to heaven, and the men he supposedly brings home won’t make either of those things happen. “Dude, this is the same story as last time. You gotta follow her rules while you’re in her house! Are you still in contact with your social worker?” I ask. “No. Why?” he said. “You qualify for a bunch of government help like job placement and housing. You should look into it”. The brother has no focus, and no marketable skills to think off. Between his physical and mental handicaps, and the social beating he’s received his whole life, he seems oddly suited for begging on the train. He doesn’t look like an able bodied worker who’s just being lazy. He doesn’t need a “raising money for my basketball team” story to sell. But somewhere in there, amongst the half-truths he tells, is a bright mind willing to do what he must to survive. “My social worker and I…” he began. Wait a minute. I’ve heard this story too. I finished it for him “…got into a fight”. He smiled sheepishly again. “I’ll tell you when we get off”. Fair enough. We continue to talk. I tell him about his old teachers and administrators I keep up with. He listens and laughs, while stealing glimpses of my sons and I longingly. He used to tell me he loved that I was an involved dad. That his problems stem from the fact that his father wasn’t there. How do you tell someone whose broken, that they’re leaning on a crutch? I realized quickly that if I was going to buy him a sandwich, I needed to do it far away from where we were going. I didn’t need his sexual inappropriateness anywhere near my sons, but wasn’t going to just let him walk away without helping. 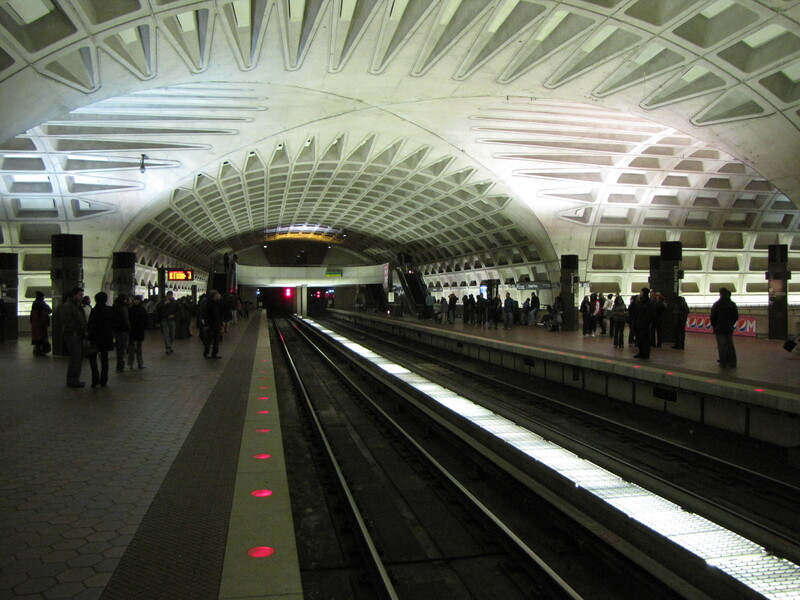 L’Enfant Plaza station happened soon enough. This is when he tells me on the escalator, “I make almost $200 a day on the train”. “Oh, I thought you really needed help”. “That is not hardly the way it went down. I was your biggest ally at that school, you ruined that”. “What are you talking about?… oh yeah”. We had talked a moment too long. I had reached out my hand to far. Again. I gave him a pound. He got off on the next stop. I’m reminded of what one of my mentors told me in college when I told him I wanted to teach. “You can’t save them all, and you’ll drive yourself crazy if you try”. I always, always hated that statement. I hate it even more now, that it’s so obviously true. Lessons I’ll take with me to the next stop. Bomani – Lovin’ it! Felt like I was sitting right next to you. I am looking forward to following your “Metro Mosaics” Can’t wait for the next post! Great post from Bomani! When was the last time that you paid attention to the details of the hustle and bustle of your morning or afternoon commute? Keep that final quote in mind with dealing with the women as well. I have shed a tear for having to let go of a woman I loved.